Kingdom of Dreams is India's first live entertainment, theatre and leisure destination, and is located in Sector 29, Gurgaon in Delhi NCR, near the Leisure Valley Park. 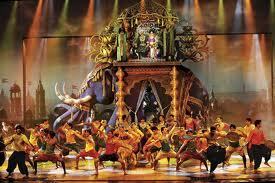 It was inaugurated on January 29, 2010 by the Chief Minister of Haryana and opened to public on September 18, 2010 by Union Minister of Tourism, Kumari Selja, with special preview of the Bollywood musical, Zangoora, starring Hussain Kuwajerwala, Gauhar Khan, and Kashmira Irani. Spread over 6 acres (24,000 m2), and built at a cost of over Rs. 200 crore, it is run by the Great Indian Nautanki Company, a joint venture between Apra Group and Wizcraft, and consists of two theatres, Nautanki Mahal and the Showshaa theatre, and a cultural and cuisine area, known as Culture Gully. Bollywood actor Shah Rukh Khan was named the global ambassador of Kingdom of Dreams on 19th September, 2010. 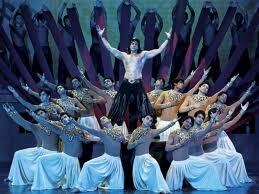 The 2010 Commonwealth Games’ official theme song, Jiyo Utho Bado Jeeto by composer A R Rahman was launched in the complex, August 28, 2010 with a performance by Rahman, accompanied by dance performances by Hussain Kuwajerwala, Gauhar Khan and Kashmira Irani, on the theme of Zangoora - The Gypsy Prince. As the name implies, Kingdom of Dreams is a spectacular world of unparalleled imagination, which brings to you a blend of India’s culture, heritage, art, crafts, cuisine and performing arts buttressed with the mind boggling technological wizardry of today. This unique tourist destination, situated at the apex of the golden triangle of Jaipur, Agra and Delhi offers you the carnival that is India. 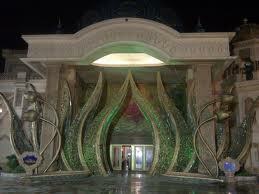 Nautanki Mahal - Nautanki Mahal is a 848-seat auditorium within the complex, with a facade designed like palace. It opened with Zangoora, a new Bollywood musical, starring, Hussain Kuwajerwala, Gauhar Khan, Kashmira Irani and Sadanand Patil. Music for the musical is composed by leading Bollywood composers, Shankar-Ehsaan-Loy, the story, screenplay and dialogues are by Javed Akhtar, Dance direction and choreography by Shiamak Davar, costumes by Neeta Lulla, while stunt direction by Alan Amin. Culture Gully - Culture Gully is an air-conditioned boulevard spread across 90,000 square feet (8,400 m2), with theme restaurants from 14 states of India, housed in representative architecture and decor. Apart from hosting street performances, artisans and handicraft stores. Opened in July 2010, the entrance to the indoor boulevard is through a 20 ft (6.1 m) gateway, made with Golden lotus petals sparkling with tiny mirrors. Showshaa Theater - Showshaa Theater is a 350-seater covered amphitheater, where stand-up routines, interactive theatre and take-offs from reality television will be performed. IIFA Buzz Lounge - The IIFA Lounge, a Bollywood-themed resto-bar on the first floor of Culture Gulley. It also showcases Bollywood memorabilia, the IIFA Awards trophy, movie costumes. It was launched on September 1, 2010 by actor, Salman Khan. Sector 29, Gurgaon - 122001.